ČSOB Poisťovňa is a universal insurance company. It provides life insurance products as well as property and liability insurance. It is one of the founding members of the Slovak Insurance Association and is one of the preferred insurance institutions in Slovakia. In 2008, a Belgian insurance company KBC Insurance NV became its sole shareholder. 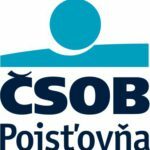 In the same year, ČSOB Poisťovňa became our valued clients. A bespoke web application created is a working tool for agents who need information about the client, the insurance policy, their portfolio as well as the details of individual insurance policies. A part of the solution is also so-called “Report Management” – a periodic generation of predefined reports. The system also enables its users to create individual reports based on the selected sorting criteria. A modern design of the website was designed in accordance with the corporate design of the entire ČSOB financial group. The website serves as an information resource for clients and is thematically divided into 3 main parts: People, Businesses and About us. The portal is built on the CMS Arnia. The solution is available at http://www.csobpoistovna.sk.